Perfection doesn’t come much closer than the 5-star Adaaran Prestige Water Villas, a luxurious all-inclusive resort in the Maldives. Every villa comes equipped with spacious sun decks and a private Jacuzzi, with the picturesque clear water of the Indian Ocean just a dive away. Take the plunge and go snorkelling or swimming to the nearby coral reef, with some of the world’s most fascinating marine life lurking. Discover the ultimate all-inclusive offering, including the on-site fine dining restaurant with a scintillating range of culinary delights. However you choose to spend your holiday in the Maldives, you’re bound to make some unforgettable memories during a stay at the Adaaran Prestige Water Villas. 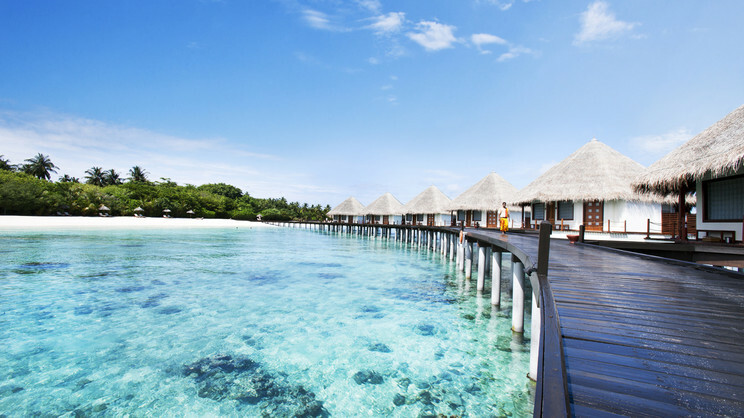 Adaaran Prestige Water Villas are located off a beautiful tropical island surrounded by powdery, white sand. Adaaran Prestige Water Villas are approximately a 45-minute sea plane transfer away from Velana International Airport.